We recommend the C5 pet vaccination for dogs. This vaccination contains the antigens against Parvovirus, Distemper virus, Canine Hepatitis virus, Parainfluenza virus and Bordetella bacteria. We recommend the F4 pet vaccination for cats. This vaccination contains the antigens against Feline Enteritis (Parvo), Calicivirus, Feline Rhinotracheitis and Chlamydia. 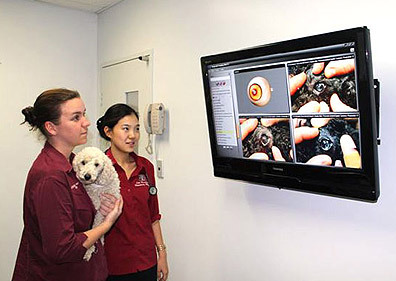 All pet vaccinations includes a written report from the veterinarian. For vaccination litter prices contact us. Do I have to vaccinate my dog? What is Parvo and how serious is it? Parvo (short for Parvovirus) is a viral disease that entered Australia in the late 1970’s and attacks the lining of the intestine as well as massively decreasing the immune system of the dog.The disease literally strips the lining off the intestine and the dog starts to bleed into the intestine, becomes massively dehydrated and starts to absorb toxins from bacteria that live in the damaged tissue. Thousands of dogs have died from Parvo in Australia and even today this disease exists. Every year there is an outbreak of Parvo in our area and during that time dogs will be presented to our animal hospital in life-threatening conditions. It is very expensive to treat and the animal needs to be hospitalised with us for up to 10 days and receive intensive medical treatment. What diseases do I need to vaccinate my cat for? 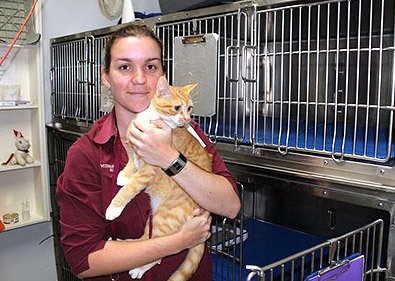 There are a number of diseases we recommend cats are vaccinated against. We use and recommend a F4 and that vaccinates the cat against Feline Enteritis (now called Feline Parvo), Feline Herpes and Feline Calicivirus (often called Cat Flu) and Chlamydia (an eye and upper respiratory problem). We recommend all cats are vaccinated once a year. What age do I need to vaccinate my dog or cat? We recommend all dogs are given a first vaccination at 6 – 8 weeks of age and then another vaccination at 12 weeks of age. We recommend all cats are given a first vaccination at 6 weeks of age and then they need another two vaccinations at 12 weeks and 16 weeks of age. All dogs and cats need yearly booster vaccinations. How long does a vaccination last for? Once the animal has its puppy or kitten vaccination program finished then the vaccine should give good protection for one year. We recommend yearly vaccinations. Some vets use vaccines that work for 3 years. Do you do this and if not, why not? We do not use the 3 yearly vaccination for dogs because, at the moment, the 3 year vaccination only covers for Parvo, Distemper and Hepatitis and does not cover the other vaccinations that we recommend. Because of this we still recommend the other diseases such as Parainfluenza and Bordetella are vaccinated against and that requires the owner still to come once a year. If we combine the 3 year vaccination along with the yearly vaccination then the owner is going to pay substantially more in cost when compared to just vaccinating every year with a C5. We also find that owners and kennels get confused about what vaccination is due and when it is due. To simplify the matter and to keep the cost down to the owner we recommend yearly vaccination using a C5. How long after my animal gets vaccinated does the vaccine take to work properly? A vaccination usually takes 10 days to have full effect. In that period we do not recommend the animal comes into close contact with any sick or suspect ill animal. Once the animal has been vaccinated properly as a kitten or a pup then the animal will have some level of immunity against the diseases it has been vaccinated against. The yearly boosters are there to just “boost” that level on immunity. After my animal was vaccinated it got sick – is this normal? 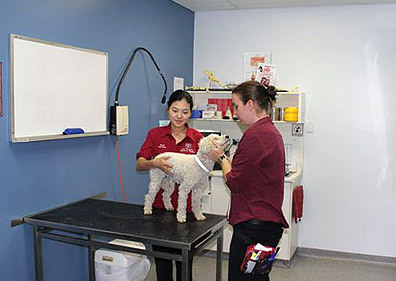 Some animals, especially small dogs and cats, will often have a reaction to the vaccination. This reaction can vary from feeling sore where the vet put the needle in, to the animal feeling sick for a day or so. We find most cats will often not want to be touched and will not eat properly for one to two days after a vaccination. This reaction is usually associated with an immune response to the vaccine (often called an allergic reaction). The dog or cat may increase its temperature and just want to be left alone. We recommend you leave them alone during this period and respect the fact that they need their own space.